Will Nepal's Latest 'Reset' With India Stick? Prachanda’s time in New Delhi was productive and cordial, but some in Kathmandu remain skeptical of India-Nepal ties. Over the weekend, Nepal’s Maoist prime minister, Pushpa Kamal Dahal (also known as “Prachanda”), visited India with high expectations. As I’d discussed last week, Prachanda’s visit had one overarching purpose: to reset the relationship with India, which had gone badly adrift under his predecessor, Khadga Prasad Sharma Oli. With Prachanda’s visit now concluded and a range of modest agreements in place between India and Nepal, it appears that the attempt at resetting ties has been successful. All that appears to be in the past. Prachanda evaluted his time in India as a success, noting that it had succeeded in setting the stage for an “environment of trust.” “The visit was more focused on creating an environment of trust with a good intention and effectively implementing the projects for Nepal’s benefits at the earliest as agreed earlier rather than raising many issues,” Prachanda told reporters after landing back in Kathmandu. Most importantly, Prachanda spoke plainly with Modi about Nepal’s ongoing efforts at implementing the country’s new constitution, which was promulgated last year despite protests from India-aligned ethnic groups known as the Madhesi and the Tharu (among others). “You are aware that my government has made serious efforts to bring everyone on board as we enter the phase of implementation of the Nepali constitution,” Prachanda told me, assuring his Indian counterpart that the resolution to the country’s constitutional crisis, by way of an amendment, was on a stable course. Despite the positivity in the Indian press about Prachanda’s time in New Delhi, there are no guarantees that road bumps won’t reemerge for the bilateral relationship. Since the collapse of Nepal’s monarchy, the country’s politics have been tinged with an increasing degree of skepticism about New Delhi’s intentions and involvement in Nepal. Oli, for instance, who leads the Marxist-Leninists in Kathmandu, lambasted Prachanda’s performance in India, resolving to oppose the joint statement between him and Modi. He’s not alone. 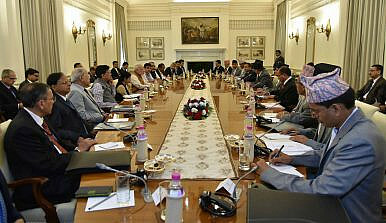 After months of strain during the constitutional crisis, many Kathmandu elites continue to remain skeptical of New Delhi. Prachanda’s claim that an environment of trust has been rebuilt is therefore somewhat exaggerated. Back in Kathmandu, it will be up to the government and its allies in parliament to convince Nepalis of the benefits of enduring ties with India.